Nanomaterials that exhibit intrinsic enzyme-like characteristics have shown great promise as potential antibacterial agents. However, many of them exhibit inefficient antibacterial activity and biosafety problems that limit their usefulness. 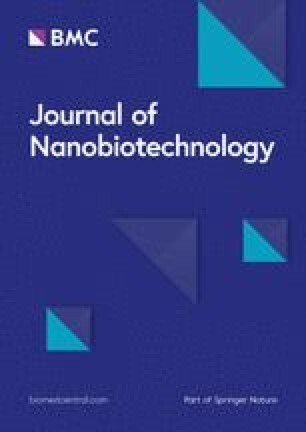 The development of new nanomaterials with good biocompatibility and rapid bactericidal effects is therefore highly desirable. Here, we show a new type of terbium oxide nanoparticles (Tb4O7 NPs) with intrinsic oxidase-like activity for in vitro and in vivo antibacterial application. We find that Tb4O7 NPs can quickly oxidize a series of organic substrates in the absence of hydrogen peroxide. The oxidase-like capacity of Tb4O7 NPs allows these NPs to consume antioxidant biomolecules and generate reactive oxygen species to disable bacteria in vitro. 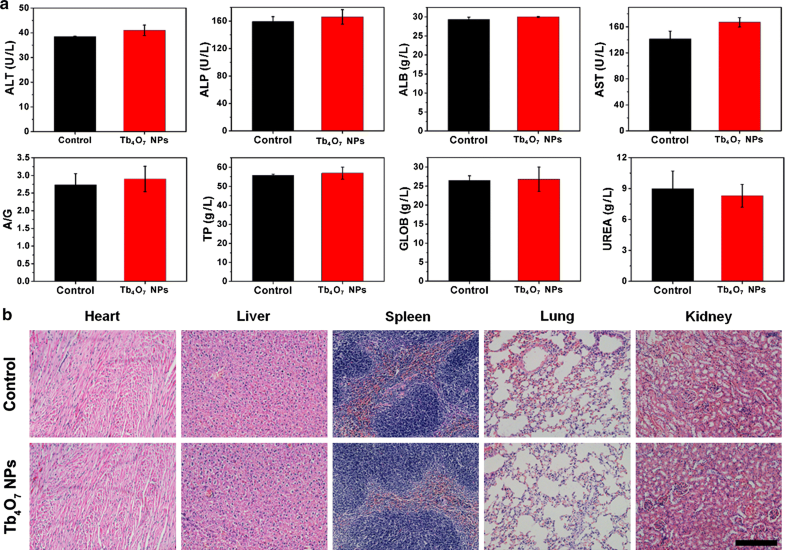 Moreover, the in vivo experiments showed that Tb4O7 NPs are efficacious in wound-healing and are protective of normal tissues. Our results reveal that Tb4O7 NPs have intrinsic oxidase-like activity and show effective antibacterial ability both in vitro and in vivo. These findings demonstrate that Tb4O7 NPs are effective antibacterial agents and may have a potential application in wound healing. The online version of this article ( https://doi.org/10.1186/s12951-019-0487-x) contains supplementary material, which is available to authorized users. Wound infection is an important cause of poor wound healing and its treatment often requires the use of antibiotics [1, 2]. However, excessive use of antibiotics may lead to the development of antibiotic-resistant bacteria, and may also cause side effects on human health, such as gastrointestinal disturbances. In recent years, developments in nanomaterial technology have provided an opportunity to develop novel antimicrobial agents. Due to the diversity in mechanisms of action against bacteria, bacterial cells are less likely to develop antibacterial resistance compared to existing antibiotics [3, 4, 5]. However, most of these nanomaterials have application limitations, such as cytotoxicity, not biocompatible for human use, and environmental concerns. Nanozymes are nanomaterials that catalyze the same reactions originally catalyzed by natural enzymes in biological systems [6, 7, 8]. Over the past several years, a wide variety of nanomaterials, such as noble metals [9, 10, 11], metal oxides [12, 13, 14], and carbon nanomaterials [15, 16, 17, 18], have been explored as potential nanozymes. Based on their intrinsic enzyme-like activity, several nanozymes have been used in antibacterial applications [19, 20, 21, 22, 23]. For instance, platinum nanomaterials have shown effective antibacterial activity in the presence of hydrogen peroxide (H2O2) . The antibacterial activity of these nanozymes are attributed primarily to their oxidase- and peroxidase-like activities that catalyze the production of hydroxyl radicals (·OH) in the presence of exogenous H2O2 and enhance the cellular levels of reactive oxygen species (ROS) within bacteria cells. Fang et al. also showed that palladium nanomaterials with oxidase- and peroxidase-like activities displayed effective antibacterial activity in the presence of H2O2 . Although many reported enzyme-like nanomaterials have been proposed as novel antibacterial agents, the high price and persistence in living tissues are still important issues. Moreover, the application of H2O2 in human wound disinfection is harmful to healthy tissue and may delay wound healing . Terbium oxide nanoparticles (Tb4O7 NPs) have been extensively used as precursors for the synthesis of lanthanide nanophosphors and superconductor materials [27, 28]. For example, Tb4O7 complexed with reduced graphene oxide composite exhibit typical green emission of terbium ions as well as the blue self-luminescence of graphene . In addition, it has been found that Tb4O7 NPs can be used as analytical reagents for food analysis . Compared with noble metal nanomaterials, Tb4O7 NPs are easier to synthesize and are less expensive. However, a review of scientific literature was unable to find any studies that described the enzyme-like activity of Tb4O7 NPs and their applications as antibacterial agents. In this paper, we show that Tb4O7 NPs have an intrinsic oxidase-like activity at acidic pH values, as they quickly oxidize a series of organic substrates in the absence of H2O2. We then demonstrate the relationship between the oxidase-like property of Tb4O7 NPs and their antibacterial activity with in vitro studies. Finally, the effects of Tb4O7 NPs on wound disinfection and healing are evaluated in in vivo studies using a wound infection mouse model. Tb4O7 NPs were purchased from US Research Nanomaterials, Inc. (TX, USA). 3,3,5,5-tetramethylbenzidinedihydrochloride (TMB), diammonium 2,2′-azino-bis(3-ethylbenzothiazoline-6-sulfonate) (ABTS), o-phenylenediamine (OPD), and Lipid Peroxidation MDA Assay Kit were all purchased from Sigma-Aldrich (St. Louis, MO). The Live/Dead BacLight bacterial viability kit and 2′,7′-dichlorodihydrofluorescein diacetate (DCFH-DA) were obtained from Thermo Fisher Scientific, Inc. (MA, USA). 5-tert-butoxycarbonyl-5-methyl-1-pyrroline-N-oxide (BMPO) and Cell Counting Kit-8 (CCK-8) were obtained from Dojindo Laboratories (Kumamoto, Japan). Escherichia coli (E. coli) and Staphylococcus aureus subsp. aureus (S. aureus) were obtained from the China General Microbiological Culture Collection Center (CGMCC, Beijing, China). Human umbilical vein endothelial cells (HUVECs) were purchased from the American Type Culture Collection (ATCC, MD, USA). The hydrodynamic size and zeta potential of the Tb4O7 NPs were measured using a Zetasizer Nano-ZS (Malvern, UK). The morphology and size of the Tb4O7 NPs were characterized using a transmission electron microscopy (TEM, Tecnai G-20, FEI). The UV–vis absorption spectrum was recorded on a spectrophotometer (UV-3600, Shimadzu). The electron spin resonance (ESR) measurements were carried out using a Bruker EMX ESR spectrometer according to our previous study [3, 9]. The final concentration of each component is described in each figure caption. All the ESR measurements were carried out at ambient temperature. After Tb4O7 NPs (100 μg/mL) treatment, bacteria (1 × 109 CFU/mL) were collected by centrifugation and incubated with DCFH-DA (10 µM) for 30 min at dark, and stained bacteria were visualized with a confocal laser microscopy. HUVECs were employed for investigating the cytotoxicity of Tb4O7 NPs. HUVECs were seeded at a density of 1 × 105 cells/well in 96-well plates and incubated overnight. The HUVECs were then incubated with Tb4O7 NPs (0–100 μg/mL) for 24 h, and cell viability was measured by MTT assay. BALB/c mice (8 weeks) were purchased from Pengsheng. On the day 0, the mice were anesthetized using 10% chloral hydrate. Then, the dorsal hair of mouse was shaved, full-thickness skin wounds with the diameter of 10 mm were created on the back of each mouse. After 24 h (day 1), the mice were treated with 50 μL PBS or Tb4O7 NPs (100 μg/mL). The Tb4O7 NPs were dripping on the surface of the wound. The Tb4O7 NPs used in the present study were purchased from US Research Nanomaterials, Inc. The physical characterization of Tb4O7 NPs is shown in Additional file 1: Figure S1 and included images of particle core size and shape captured by TEM, the mean and homogeneity of particle hydrodynamic size by dynamic light scattering (DLS), and particle absorption spectrum by UV–vis. According to TEM and DLS data, the dispersity of Tb4O7 NPs is poor. The mean core particle size of Tb4O7 NPs is approximately 200 nm (Additional file 1: Figure S1a, b); while the DLS result of Tb4O7 NPs is around 400 nm (Additional file 1: Figure S1c). This is mainly due to the size measured by DLS was a hydrodynamic size, and therefore the nanoparticles showed a larger hydrodynamic volume due to solvent effect in the hydrated state. The zeta potential value of Tb4O7 NPs is 31.6 mV in water. The UV–vis spectrum of Tb4O7 NPs is shown in Additional file 1: Figure S1d. The oxidase-like activity of Tb4O7 NPs was evaluated using the substrate TMB. 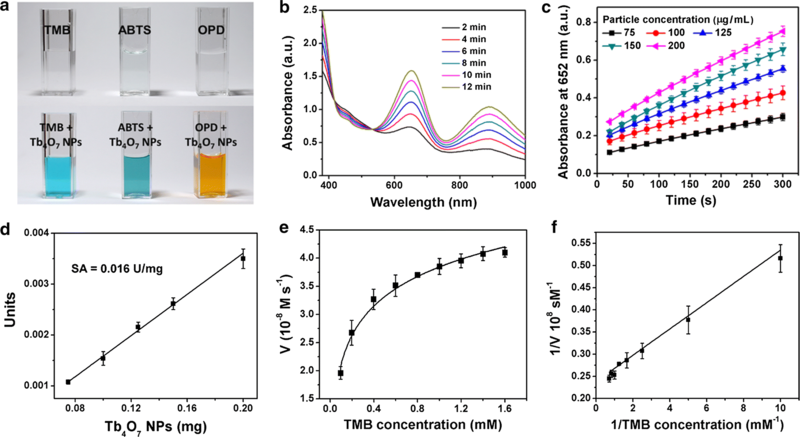 The UV–vis spectroscopy measurements show time-dependent increases in TMB oxidation catalyzed by Tb4O7 NPs, yielding a blue-colored product (Fig. 1a, b). In addition, Tb4O7 NPs can also catalyze the oxidation of ABTS and OPD (Fig. 1a). We used the oxidation of TMB as a model reaction and found that the catalytic efficiency of the Tb4O7 NPs is dependent on TMB concentrations, pH and temperature (Fig. 1c and Additional file 1: Figure S2). As shown in Additional file 1: Figure S2a, Tb4O7 NPs exhibit excellent catalytic activity over a broad temperature range (25–60 °C). Moreover, an acidic condition (pH = 3.6) is conducive to the oxidase-like activity of Tb4O7 NPs (Additional file 1: Figure S2b). We adopted pH 3.6 and 25 °C (room temperature) as the standard conditions for subsequent studies. Next, we determined the apparent steady-state kinetic parameters for the reaction of Tb4O7 NPs with TMB. Typical Michaelis–Menten curves were established (Fig. 1d). The curves were then fitted to the double-reciprocal Lineweaver–Burk plots (Fig. 1e), from which the kinetic parameters shown in Table 1 were determined. The above results show that Tb4O7 NPs have oxidase-like activity oxidizing TMB, ABTS, and OPD in the absence of H2O2. We predict that Tb4O7 NPs would deplete intracellular antioxidants and, eventually, disrupt the antioxidant defense systems of bacteria. To test this hypothesis, we examined the effects of Tb4O7 NPs on ascorbic acid (AA) oxidation in vitro. AA is an important endogenous bacterial antioxidant that prevents cellular damage from ROS. AA can be oxidized to form an intermediate ascorbyl radical (·AA), which is detectable by ESR spectroscopy . As shown in Fig. 2a, the oxidation of AA was negligible within 10 min, while in the presence of Tb4O7 NPs the system showed a time-dependent increase in the ESR signal intensity in the first 8 min and then decreased over time. These results indicate that Tb4O7 NPs can accelerate AA oxidation. In the substrate oxidation mechanism of most oxidases in nature, oxygen acts as the electron acceptor and is reduced to H2O2. To gain a better understanding of the oxidation of AA by Tb4O7 NPs, we examined whether the catalytic oxidation product of Tb4O7 NPs and AA produced H2O2. As shown in Additional file 1: Figure S3, a marked increase of H2O2 was detected in the presence of Tb4O7 compared to control (AA alone). Moreover, the production of H2O2 was Tb4O7 concentration-dependent. Previous studies have demonstrated that several kinds of nanoparticles are capable of catalyzing the production of hydroxyl radicals by H2O2 [30, 31]. Therefore, we determined whether Tb4O7 NPs would catalyze the production of hydroxyl radicals by H2O2 using ESR spectroscopy. We selected BMPO as the capture agent, since BMPO can capture hydroxyl radicals to form BMPO/·OH adducts indicated by the presence of four characteristic lines on the ESR spectrum. As shown in Fig. 2b, the characteristic ESR signals of BMPO/·OH were negligible in the absence of Tb4O7 NPs. However, the addition of Tb4O7 NPs resulted in a strong ESR spectrum that displayed the four characteristic lines (1:2:2:1) of BMPO/·OH. These results clearly show that Tb4O7 NPs can be used as a catalyst in the decomposition of H2O2 to produce hydroxyl radicals. Taken together, our results confirm that Tb4O7 NPs are capable of catalyzing the oxidation of biologically relevant antioxidant agents, resulting in the production of H2O2. Moreover, Tb4O7 NPs can further catalyze the production of hydroxyl radicals via the decomposition of H2O2. Both H2O2 and hydroxyl radicals have strong oxidizing ability and can oxidize biological macromolecules, such as proteins and phospholipids . Our study found that Tb4O7 NPs with oxidase-like activity can catalyze the production of H2O2 and further produce hydroxyl radicals. Therefore, the oxidase-like activity of the Tb4O7 NPs makes them potentially useful as antibacterial agents. We evaluated the antibacterial activity of Tb4O7 NPs against E. coli and S. aureus. A colony-forming units plate counting method was used to determine the antibacterial ability (Fig. 3a, b). As compared to the PBS control group, Tb4O7 NPs exhibited potent antimicrobial activity against both S. aureus and E. coli in a concentration-dependent manner. 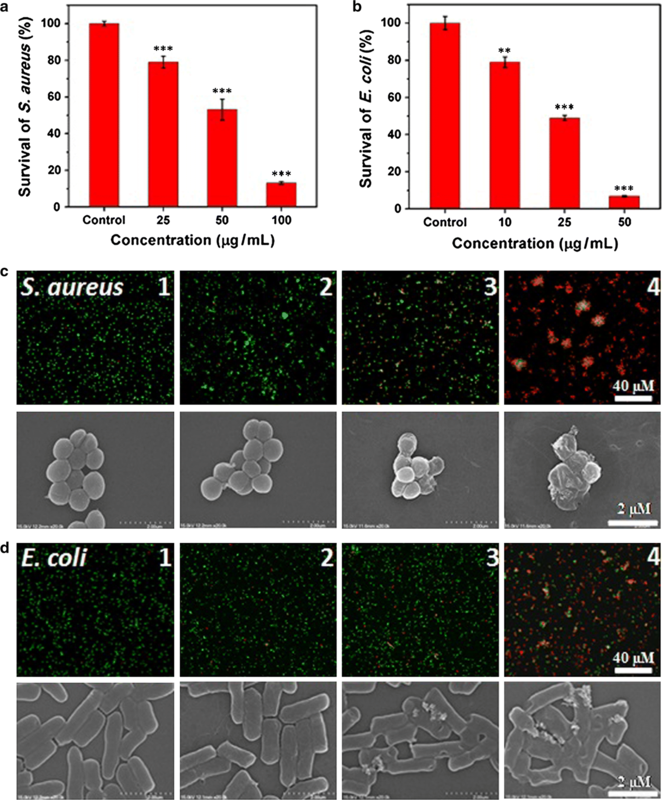 At a concentration of 25 μg/mL, Tb4O7 NPs exhibited only modest antibacterial effects against S. aureus; more than 80% of the bacterial cells survived. However, when the concentration of Tb4O7 NPs was increased to 100 μg/mL, nearly 90% of the S. aureus were killed. A similar trend of antibacterial effects were observed towards the E. coli. To further investigate the interaction between Tb4O7 NPs and bacteria, a fluorescent-based cell live/dead assay was conducted. As shown in Fig. 3c, d, Tb4O7 NPs exhibited significant antibacterial activity against both S. aureus and E. coli, which was consistent with the aforementioned results. The exposure of S. aureus cells to Tb4O7 NPs at a concentration of 100 μg/mL resulted in nearly 100% lethality, as evidenced by the dominant red fluorescent signal. At a concentration of 50 μg/mL, Tb4O7 NPs completely inhibited the bacterial growth of E. coli. The morphology and membrane integrity of bacteria were then determined by SEM (Fig. 3c, d). Untreated S. aureus displayed a typical rod-shaped structure with a continuous, smooth surface. When exposure to the 50 μg/mL of Tb4O7 NPs, the S. aureus bacterial cell walls became partially wrinkled and discontinuance. Notably, after treatment with 100 μg/mL of Tb4O7 NPs, the S. aureus bacterial cell walls showed much more pronounced damage, indicating stronger antibacterial effects at higher concentrations of Tb4O7 NPs. A similar tendency was found for E. coli. The loss of membrane integrity of E. coli was observed at concentrations lower than 100 μg/mL of Tb4O7 NPs treatment. Moreover, Tb4O7 NPs were observed by SEM and SEM-energy dispersive X-ray spectroscopy (EDS) to aggregate on the surfaces of S. aureus and E. coli (Additional file 1: Figure S4). It is known that the proton motive force decreases the local pH (as low as pH 3.0) in the cytoplasm and membrane of bacteria cells [33, 34]. Since we found that Tb4O7 NPs exhibit oxidase-like activity under acidic conditions, we speculate that the antibacterial mechanism of Tb4O7 NPs may arise from their oxidase activity to accelerate the process of bacterial cell oxidation and consumption of antioxidant biomolecules, leading to a reduction of oxygen products including H2O2 along with other antibacterial activity from the accumulation of ROS. To confirm this hypothesis, the intracellular levels of ROS were determined using the florescent probe, DCFH-DA (Fig. 4). For both S. aureus and E. coli, the untreated cells showed extremely weak fluorescence, indicating low levels in the formation of intracellular ROS. In contrast, bacterial cells exposed to Tb4O7 NPs showed high levels of ROS formed within the cellular cytoplasm, as evidenced by the strong fluorescence signal. We also found that the generation of ROS is Tb4O7 NPs dose-dependent (Additional file 1: Figure S5). The above findings suggest that Tb4O7 NPs may have role as an antibacterial agent for bacterial infections in vivo. To assess the antibacterial capacity of Tb4O7 NPs in vivo, a wound infection model was constructed using BALB/c mice. A wound was introduced on the back of the mouse and an infection was established by implanting S. aureus into the wounded area. After infection was established, PBS or Tb4O7 NPs were applied to the infected wound. Figure 5a, b shows the progress of the wounds. Compared with the control (PBS treatment) group after 3 days, the wound area was reduced under Tb4O7 NPs treatment. After treating of 7 days with Tb4O7 NPs treatment, the wounds were nearly healed completely. In contrast, obvious scab was observed from the control group, indicating incomplete recovery. Biosafety is an important factor for antimicrobial agents designers. To assess the biosafety of Tb4O7 NPs, we first determined the effects of Tb4O7 NPs on red blood cells and HUVECs in vitro. The effect of Tb4O7 NPs on cell membrane disrupt was first determined by a red blood cell hemolysis assay. As shown in Fig. 6a, pure water can cause severe red blood cells hemolysis within 2 h. In contrast, the introduction of Tb4O7 NPs did not cause signs of hemolysis. In this experimental result, the hemolysis rate was still less than 1% at a concentration of 100 µg/mL, which fully demonstrated that Tb4O7 NPs have good blood compatibility. Meanwhile, the cytotoxicity tests on mammalian cells HUVECs further confirm the biosafety of Tb4O7 NPs (Fig. 6b). Then, the biosafety of Tb4O7 NPs in vivo were determined. As shown in Fig. 7a, the indicators in blood were within the normal range. The major mouse organs (heart, liver, spleen, lung, and kidney) were formalin-fixed and processed for the evaluation of H&E sections by histopathology (Fig. 7b). No obvious mouse organ damage was observed from Tb4O7 NPs treatment. In summary, this study demonstrates for the first time that Tb4O7 NPs exhibit oxidase-like activity. In addition, the results of this study established a relationship between the oxidase-like enzyme activity of Tb4O7 NPs and their antibacterial properties. The data collected from this work revealed that the oxidase-like activity of Tb4O7 NPs was able to function with a variety of substrates, including biomolecules, and resulted in the generation of ROS, which further enhanced their antibacterial activity. The application of the antibacterial activities of Tb4O7 NPs were demonstrated in a wound infection mouse model. Our study provides evidence that Tb4O7 NPs can be utilized as an efficient antibacterial agent and the potential applications in wound healing are promising. CL, YS, and XL prepared and performed the experiments. YS, XL and YL analyzed the data and interpreted the results. XT, SF and YP conceived and supervised the study. The manuscript was written by XT and XJ, and revised critically by JY and MB. All authors read and approved the final manuscript. All data generated or analyzed during this study are included in this published article and its additional file. All authors agree to be published. The protocols and the use of animals were approved by and in accordance with the animal welfare committee of Soochow University. This work is partially supported by the National Natural Science Foundation of China (31400862), a project funded by the Priority Academic Program Development of Jiangsu Higher Education Institutions (PAPD), Jiangsu Provincial Key Laboratory of Radiation Medicine and Protection, Guangdong Science and Technology Department (2017B030314026). This article is not an official U.S. FDA guidance or policy statement. No official support or endorsement by the U.S. FDA is intended or should be inferred. Additional file 1: Figure S1. Characterization of Tb4O7 NPs. Figure S2. The oxidase-like catalytic activity of the Tb4O7 NPs. Figure S3. The concentration of H2O2 generated in the catalytic system. Figure S4. SEM-EDS elemental images. Figure S5. ROS levels of S. aureus.